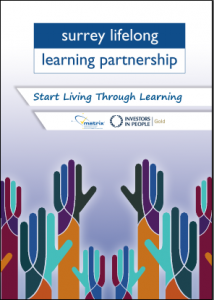 ‘Start Living Through Learning’ tells the story of what is working in developing projects and social enterprises which will continue engage those who are hard to reach in learning valued by the community. It illustrates perfectly how funding invested can be made to count for many times its face value. We hope this document illustrates what can be achieved through partnership and stimulates further innovation. Indices of Deprivation 2010 at Lower layer Super Output Area (LSOA) level were published by the Department for Communities and Local Government. Surrey Lifelong Learning Partnership is particularly interested in the domains for Education, Skills and Training, Employment and Income. Listed below are the ten areas that score poorly in these three domains. New data for 2015 is being analysed to see how the picture has changed. We also meet with partners and review other research and intelligence relation to learning needs with a view to identifying barriers to learning and gaps in provision.